Cut asparagus spears diagonally into 1-inch pieces. Remove and discard skin from smoked haddock, tear into 1 inch slices. Chop garlic finely. 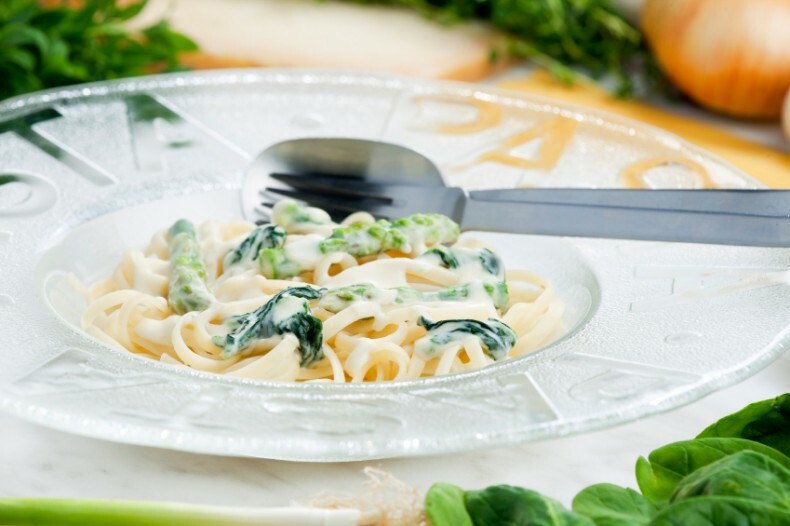 Cook the linguine in boiling salted water for 6 minutes, add the asparagus and cook together until the pasta is al dente (another 3 to 4 minutes). Drain and return to pan. Whilst the pasta is cooking prepare the smocked haddock. Heat half the olive oil in a large heavy-bottomed pan. Add the cinnamon stick, smoked haddock wine and season with salt and black pepper. Cook for only 3 minutes. Remove cinnamon stick. Toss the drained pasta with the remaining extra virgin olive oil and black pepper, add the smoked haddock and juices, check for seasoning and sprinkle over the roughly chopped basil leaves.